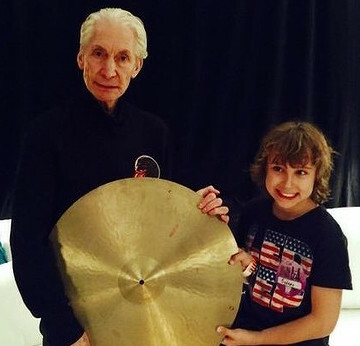 No one gets near the Rolling Stones…except a precocious 11-year-old Sydney boy called Jagger, who calls the band’s drummer, Charlie Watts, his mentor. Jagger Alexander-Erber is the Australian drumming prodigy first seen on Australia’s Got Talent in 2012, and he has three drumming heroes: Keith Moon, John Bonham and Watts. On Wednesday he…gave Watts, 73, a gift, a rare cymbal – once owned by Watts’ own hero, Jackie Dougan. He was repaid by being allowed to sit for photos at Watt’s 1963 Gretsch drum kit in front of a packed Allphones Arena minutes before the Stones four-star show began. Watts told Jagger the only other people allowed to sit there were his grandchildren. “The best thing is Jagger will now have Charlie Watts as a mentor. The connection he made was incredible … [although] Charlie doesn’t have a phone or use email. [My son] is now known to the Stones camp,” Mr Alexander-Erber said. This entry was posted in Drum/Music News and tagged Charlie Watts, Drummer, Gretsch, Jackie Dougan, Jagger Alexander-Erber, Rolling Stones, Scott K Fish. Bookmark the permalink. Charlie: my favorite drummer ever!